BIG Ron is at home right here, at the Froneben Intermediate Station of the Schlick 2000 skiing centre. The fun guy watches the next generation of skiers together with his team of skiing instructors and nannies. Although BIG Ron has a wooden foot, he knows a thing or two about skiing too. And BIG Ron particularly looks after the little ones. He thus invites the youngest guests (starting from 3 months) to the playing and warming room. The BIG Family Kinderland, a flat, separated area in the proximity of the Froneben Intermediate Station, comes with special devices that facilitate learning how to ski. 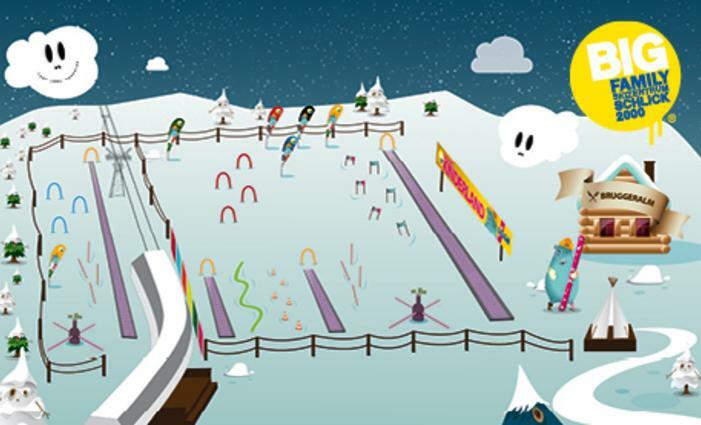 Three magic carpets, two merry-go-rounds in the snow, a Tipi as well as slalom and training course guarantee fast learning success, variety and fun for children. The perfectly trained ski instructors are not only aware of the latest techniques, but look after your kids with great patience. Once the little ones are able to securely move on skies, the group explores the Schanzlin training hill. We ask for your understanding that the use of Children’s Land and its conveyors is exclusively reserved for SchischuleStubai for safety reasons. Skiing is a tiring activity. Playing in the warm room, resting or having a delicious meal is exactly what kids need from time to time! BIG Ron’s Kinderland offers a playing and warming room where children can take a break from their tiring outdoor activities. Even children starting from 3 months are affectionately taken care of here. Their parents can thus fully enjoy their skiing day, while their loved ones are perfectly set. A separate dorm and relaxation area invite kids to take naps. A changing table is available as well. No advance notification necessary. Lunch time between 12.00 and 1 pm. It is however possible to book the lunch-time supervision including lunch and beverage for children starting from 3 years.